Boardmasters Festival Offer: FREE goodie bag with every booking! 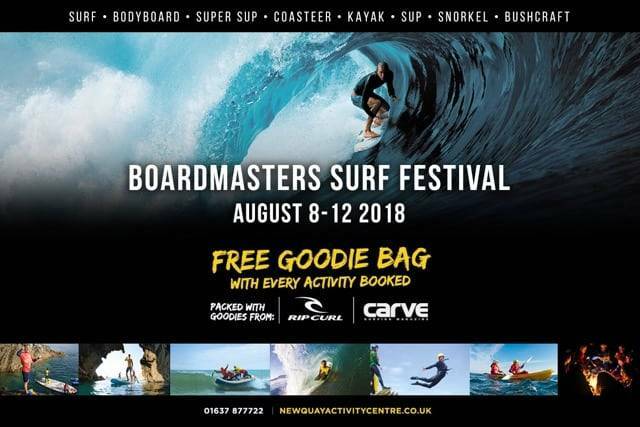 Take home a free goodie bag worth £20 when you book any activity with Newquay Activity Centre during the Boardmasters Festival 2018 weekend! We’re celebrating the return of Boardmasters Surf and Music Festival this August with a special Boardmasters give-away! 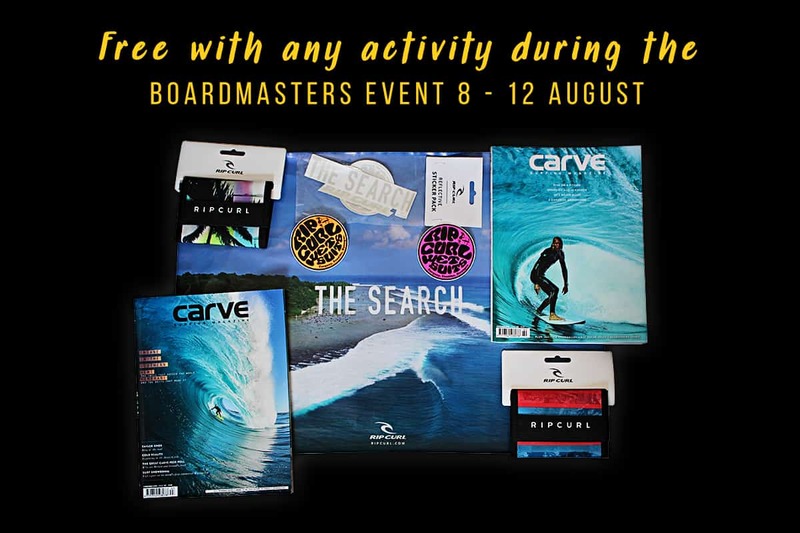 For every adventure activity booked with Newquay Activity Centre between the 8th and 12th August, you’ll receive one free goodie bag packed with treats from one of surfing’s biggest brands, Rip Curl and Carve Surfing Magazine. We’re stoked to share our collaboration and help you experience the surfing lifestyle for yourself this summer! Boardmasters is located in an exciting hive of ocean activity and we think you shouldn’t leave without getting stuck in to the elements! We want all festival goers to embrace our Cornish culture and lifestyle by living the ultimate dream with a sunset surf or epic coasteering expedition. Our perfectly located centre is a stone’s throw from the golden sands of Towan and Fistral Beach, which are known worldwide for their quality waves, and pristine sands. Fistral offers some of the most consistent surfing conditions in the UK and is why the Boardmasters surf competition is held here every year. Get stoked with one of our surfing experiences, sponsored by Rip Curl, you will love it. We offer a whole host of coastal adventures to sink your teeth into, just have a look at our awesome ocean based activities, take your pick and give our friendly team a call today! There’s no better way to prepare for another night of grooving than by plunging into our beautiful waters with a fun activity. Boardmasters Surf and Music Festival 2018 will bring out the good vibes so make sure you hit the surf and find out what all the fuss is about! Our awesome team is available on 01637 877722 every day from 8am until 10pm.